An outside micromter is more affordable than the thickness gauge style micrometers which have a dial or digital face. An outside micrometer may work in applications in which the measurement is taken in an awkward position or that requires a reach, whereas the thickness gauges require a much more steady hand with which to take the measurement. 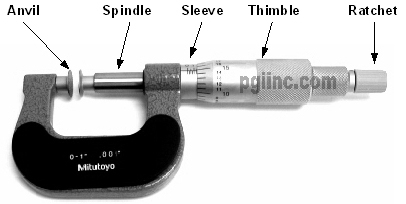 A user with a larger hand span can learn to maneuver the outside micrometer with one hand. And if you need to have an extra hand, you can purchase an outside micrometer stand. So, if you are thinking about buying an outside micrometer, or you already own one and you are having trouble learning how to use it, read our "How to use a micrometer" page. It will tell you everything you need to know to take outside measurements using an outside micrometer with either a .001" or .0001" resolution. What is a Linen Tester? Often, measuring with a caliper or micrometer means you are going to be talking about very small numbers. For example, the thickness of a piece of paper, film, or even a mouse ear! Sometimes, it is easy to get tangled up and confused by what to call all those digits behind the decimal point. To help get our customers untangled we created a web page that illustrates decimal point places as a handy reference. Let us know what you think by submitting a comment. Sharp, photographic-quality, optical lens group composed of two coated lenses. Adjustable focus. Heavy, solid, metal construction. Lens pops out of box for use, conceals for protection. Includes protective case. Viewing Area: 3/8" diam. Overall Size: 2-1/8" x 1-1/8" x 7/8"
An all-purpose, standard mechanical micrometer calibrated in increments of 0.001". Positive contact to gauge the thickness of all types of paper and paperboard. Overall Size: 5-1/2" x 1" x 2-1/4"
Eliminates parallax, offers Quick Alignment. Ensure the accuracy of the final register by stripping and lining up properly. Elminate errors by forcing the eye to look straight down at a right angle to the surface. Multiple operators can print a plate and lock up the chase the same. Fatigued eyes look at the line up mark in the same way as fresh eyes. Compare to Para-Mag™ and StripMaster™. You won't find a better price anywhere! Flat field of view. Focusing, coated, achromatic lens group. Clear base allows for easy and bright viewing in low-light levels. Protective case included. Viewing Area: 1/4" diam. Overall Size: 1" x 1" x 1-3/4"
Don't let the name fool you-our products can be used for graphics work or any application where fine inspection is required. Using this blog we'll be able to let our current and potential customers know about our great line of products including micrometers & calipers, high-powered magnifiers, pre-press equipment, plant & workplace safety equipment, and microscopes. We'll let you know when we have sales, and discuss the uses of our equipment. We hope you will find this information useful.